Ahh the sandwich. A classic lunch food. 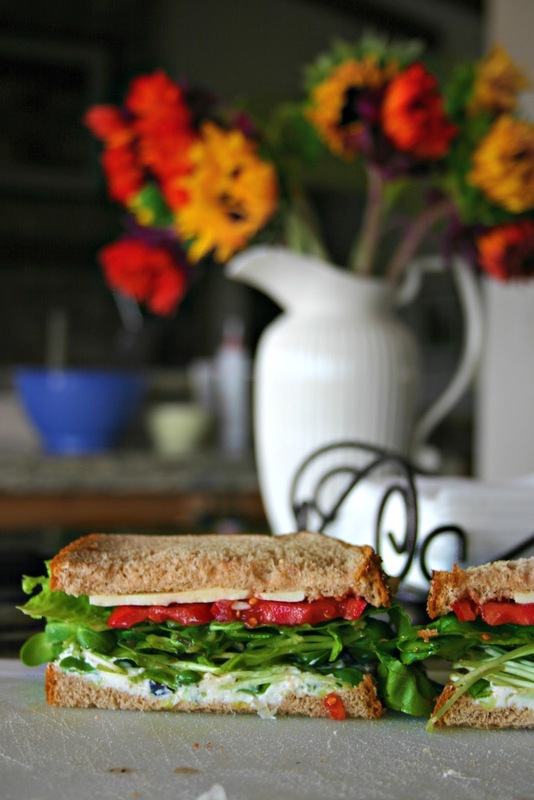 For those of us who get bored with the day in, day out routine that lunch can so often be, here is a fast and easy twist on the classic lunch sandwich. Before I begin, keep in mind that all these portions are for just one sandwich and my personal preference. Making two or three? Double or triple what I did. You get the picture. Let's get started. Chives, green onions, whatever you would like to call them, chop those babies up. This is for the spread. Then get a bowl or small plate and mush up some cream cheese. This will make it easier to deal with later. Add the chives, and some spices to the cream cheese. Mrs. Dash is seasoning gold. I put it on everything. So I used some Mrs. Dash garlic and herb, along with some salt and pepper. You can do whatever though, onion powder, garlic powder, even fresh garlic. Mash, mash, mash till it's all good and blended. Yay here is the fun part. Picking your sandwich content! You can be as crazy or conservative as you feel that particular day. This is what was in my fridge. Sometimes I'll add cucumbers, avocado, bell peppers, spinach, whatever. I just stay away from the onions because they are already in the spread. Spread you new spread on one piece of bread, and on the other, I put three slices of pepper jack cheese. I like to use the cream cheese as a glue for vegetables that like to make a run for it while you eat..like the sprouts. So I packed my sprouts on there and cut up a tomato on the other half. And just in case there isn't already enough flavor here, I drizzled just a teeeeny bit of balsamic on the sprouts. And that's it! Slap that lettuce on there, and put that sandwich together. Take a picture if you're proud. Side note: If you are like my boyfriend (Alex) and can't stand cream cheese, there is an equally delicious spread which requires no dairy at all. It's basically a modified guacamole. Mash up avocados, throw in a pinch of salt here, some garlic there and a dash of cholula sauce. Easy shmeasy.